Description:The Stainless Steel Ice Cream Scoop is a good tool for making ice cream ball.Easy to squeeze out the ice cream ball,also suitable for using with mashed potatoes. 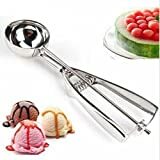 Features:Scoop Depth: 4cm Length: 22.5cmMaterial: Stainless SteelColor: Silver Package Contents:1 x Stainless Steel Ice Cream Scoop Notice:1.Please allow 1-3mm error due to manual measurement. Please make sure you do not mind before you bid.2.The colors may have difference as the different display,please understand.